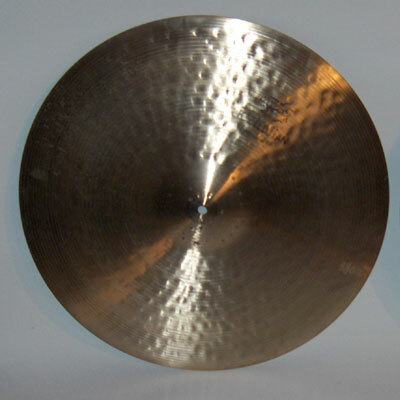 The "ride" cymbal (or "large Turkish cymbal") refers to a shape of Turkish cymbal (with a central dome), large and thick (18 to 24 "diameter, 20" is the standard size (with the largest diversity of models), the brands often offer many different thicknesses for the same model, manufacture and size). 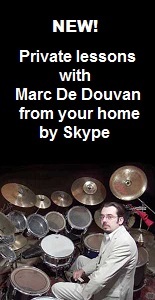 These qualities allows it to get less easily in saturation (or "crash"), and thus highlights a fast playing with sticks without masking the attacks (it is the subtle "ping" of the tip of stick ("olive" in french) on the flat of cymbal). Hence its name to play phrases similar to horse gallop, like the famous "chabada" of jazz. Contemporary jazz drummers like Daniel Humair , André Ceccarelli , Peter Erskine or Jack de Johnette , often play entire solos only on ride cymbals (they often use several at the same time). The large size of the ride also justifies an extreme richness of timbre and expressiveness. This is why I advise to pay special attention to the choice of your ride, which will surelly be a key element of the personality of a drum set and the sound that you will bring out of it. In addition, a bit like for a cook, without good ingredients, you will never make good food (this is a precept which applies to all arts, where the detail have a primordial importance, because directly affecting the feelings and not the intellect). But beware, the intrinsic quality of a cymbal (and a tool in general) is not to be considered in the absolute, but in relation to what you can do with it. This is what I notice with bitterness after buying one of the most expensive and worked cymbal on the market (which I would not quote to not harming the manufacturer, however deserving), which the beauty of itself was absolutely not to question, but which the too strong presence came in my opinion in a too big (and destructive) "competition" with my other instruments and my own play! I found my ideal cymbal with a "leopard ride" (see at the general description of cymbals), which creates a perfect complementary counterpoint to all other instruments, and allows me to fully express and use all my technical and gestural potential without hinder them. The drummers mentioned above are also fond of this type of cymbal and also metal drummers, probably for the same reasons. 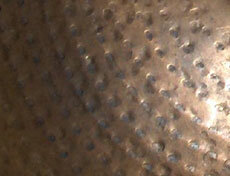 You can, if you desired, to add rivets to a cymbal (from 1 to 6, in general), which has the effect to prolong the high vibrations and muffling the low overtones and saturation a little more (this process resembles to the snare on drum skin). You can also just add a "rattler" ("chain") that hangs on the cymbal, fixed on stand, for a similar effect but less present. As for me, I do not fond of these methods which impoverish the sound and expressiveness of the cymbal, but I admit that it can be interesting in a cabaret, to muffle and "flatten" the sound (reduce the amplitude of dynamics for a play with rebounds, notably for "fast bop") and play with brushes, to perform imitation of "smooth" crash. The playing of chabada on the ride cymbal instead of the hi-hat was initiated by Kenny Clarke in the 1940s, with the "Bebop" style (Gene Krupa , iconic drummer of "swing" era and big band of the 1930s, did not have a ride, for example). 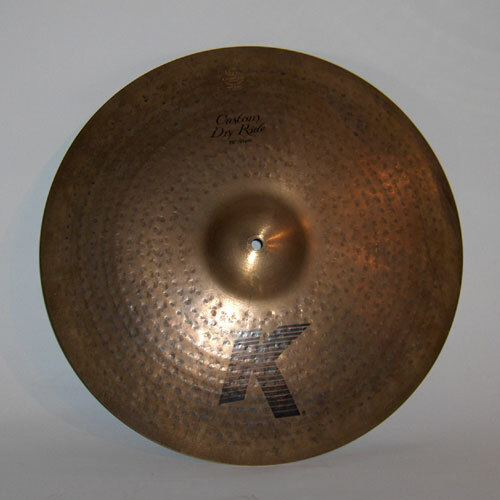 The ride cymbal is traditionally placed on the right side above the floor tom, the most comfortable and accessible position for the right arm (which can then stay along the body). Some drummers prefer to put it above, closer to the center, in favor of a crash or a suspended hi-hat to punctuate rolls on toms (it is the case of Dennis Chambers , Dave Weckl , and Horacio Hernandez for example, but they also play with two floor toms, which extends the kit on the right). Others removed the right medium (suspended) tom above the kick drum, to place it here, in a more accessible place, and put a crash, above, on the right (like Buddy Rich , for example). Finally, some drummers play (or played) exclusively on rides, with more crash qualities (Elvin Jones , Brian Blade, for example), which requires cymbals with exceptional qualities of versatility and expressiveness.